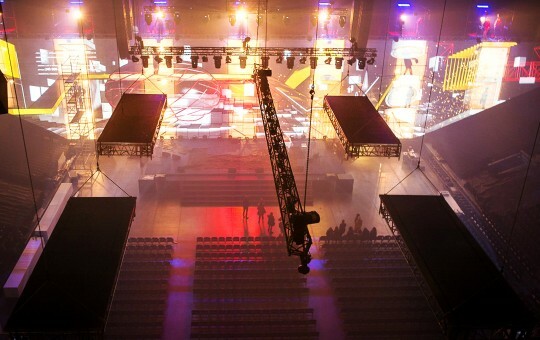 We offer the greatest selection of standard stages for your personal, corporate or any other event in Lithuania. Over many years we have accumulated great deal of experience of working in difficult weather and landscape conditions. Security and stability are the main criteria that we follow. However small or numerous is your crowd, the stage will help you to have once in a lifetime celebration. 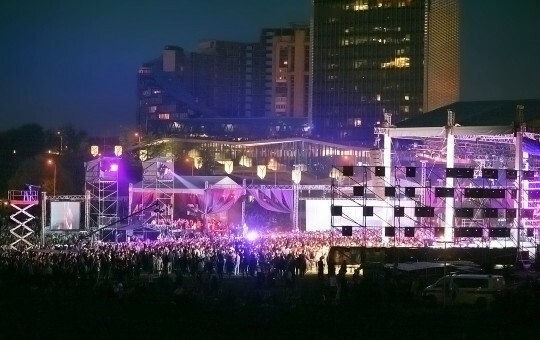 In case of a really special and challenging event, we offer customized solutions and additional technical equipment: non-standard stages, non-standard constructions, roofing systems, platforms, crowd control barriers, etc. All our standard constructions can be modified and adapted to your needs on request. Rigging equipment comes handy when your event takes place in an arena or similar enclosure and you need to install outdoor stages. 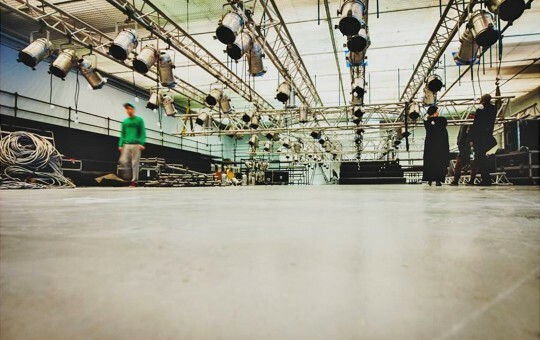 We offer our rigging equipment to build roofing systems, sound, lighting, special effects, video facilities, etc. When the installation process is extremely complex, STS professional high climbers come to help. For your convenience, STS offers a variety of rigging mechanisms and accessories for rent. It is important to note that we are the only company in Lithuania fully certified to test lifting equipment. 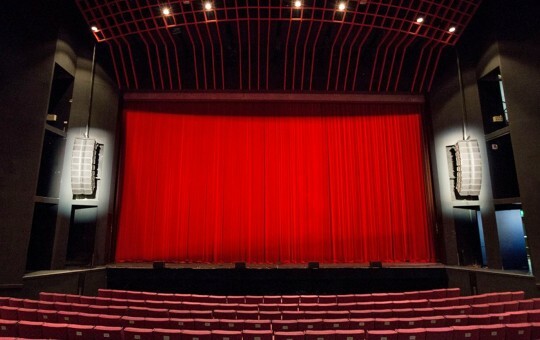 Stage lighting solutions can drastically vary depending on the character of the event, the lighting director’s imagination and, of course, the client’s budget. STS offers different kinds of lighting equipment to make any event spectacular and memorable. 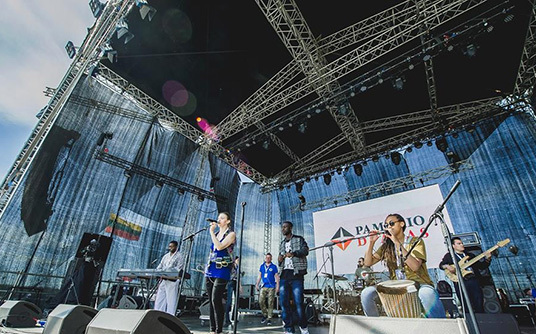 A proper audio system is one of the most important features of a successful event. We offer different sound system designs for different types of events. The sound system can be customized according to the venue characteristics and your budget. STS can offer various video equipment for your event: our screens come in different sizes and resolution, with framing structures and projectors of different capacity. 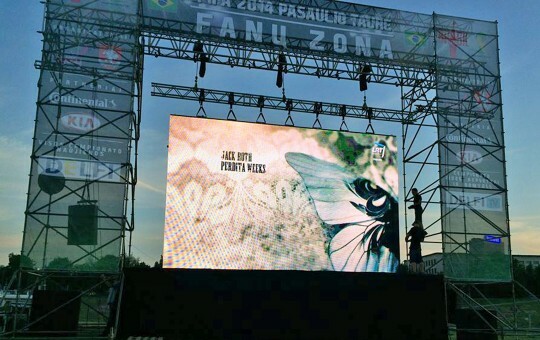 High resolution LED screens can be installed both indoors and outdoors.